designed and hand-crafted for collectors by Helen Oliver in Crowle, Worcestershire, England. Ive always loved teddies, says Helen, Ive still got Edward, who was given to me on my first birthday, but Id never considered collecting them before, let alone making them! It was in 1992 when Helen asked her husband, Steve, for a collectors teddy bear as a Christmas present. They visited Stratford Teddy Bear Museum where she picked up a magazine and was astonished at the hundreds of bear shops, makers and fairs listed inside it - I had never imagined the bear world to be so large! says Helen. Steve presented her with Josh, a Crafty Bear by Shirley Latimer. Shirley told me that if Josh was Helens first collectors bear, then I should be prepared for an expensive new year, says Steve, and she was right! Helen immediately became a collector, and started visiting bear fairs and shops in earnest. At a Cheltenham fair in 1993 she purchased her first bear kit. I was very proud of Clancy, she explains, his eyes and nose were a little lopsided - but he didnt seem too concerned about it! Ive always enjoyed sewing, making my own curtains and soft furnishings, but I had never considered making a bear before. She then bought a piece of mohair and a pattern, and again was pleased with the result but felt the bear would look better with larger feet and a fatter tummy, and so set about designing her own pattern. The result was a total disaster - unrecognisable as a teddy bear, but after several alterations and two more attempts, I was happy with my bear, says Helen. More patterns followed and gradually a small collection of bears of various shapes and sizes started to build up. The Hoo Hug started to develop a number of real characters. There was Sam in his tartan scarf, a big bagpipes fan who delighted in annoying others with his humming of Scotland the Brave at 4 am in the morning. Who said bears were cheap to feed? Timothy proved the exception to the rule due to his fondness for a whole 3 jars of honey a day. And, of course, the eternally sleepy Humphrey - with his pillow tucked under his arm, forever falling asleep in the strangest of places! 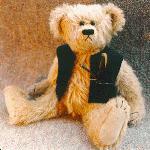 So, in August 1994, several anxious little bears travelled over to the Christie Bears shop. But they neednt have worried, says Helen, because two of them found new homes on the very first day! That really spurred me on, since then I havent looked back. Ann was always very supportive, and was instrumental in getting me going - I shall always be grateful to her." Helen and Steve's spare bedroom soon became the Bear Room, for some reason I seem to spend most of my time in there! There are pellets all over the carpet, shelves piled high with various type of mohair, eyes, joints, various limbs and bits of fluff lying all over the place, and in the middle, somewhere amongst the bags of stuffing, is her sewing machine. I tend to make either one-of-a-kind bears or very small limited editions, she explains, since I enjoy experimenting with different fabrics and always have new ideas I am eager to try out. I usually have several bears on the go at the same time and then I can pick up whichever bit I feel like doing at the time. Steve inserts the joints into the bears (naturally theyre put under ted-aesthetic before he starts!) He also does all the administrative things, like designing and printing my brochure and dealing with all the correspondence. 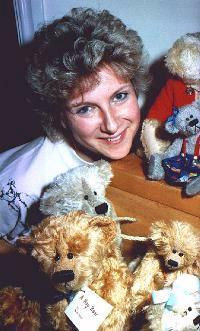 Helen started doing mail-order back in 1994, and the first version of the Hoo Bears website went live in the Spring of 1996 - in fact it was only the second British bear website to appear on the internet. Now in 2004, she has more than 1700 bears under her belt spread all around the world, with over 600 different names and she's fair exhausted! © 2001, 2004 Hoo Bears. All Rights Reserved.